This is our first year using God’s Great Covenant from Classical Academic Press. 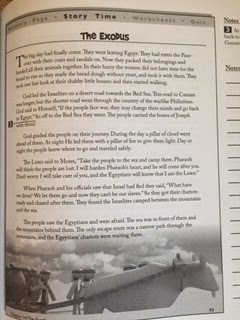 I felt that Curly (3rd grade) was ready for a more in-depth study of the Bible so I chose the first book in their series – Old Testament 1: Genesis to Ruth. There are 4 sections to each week’s worth of work. 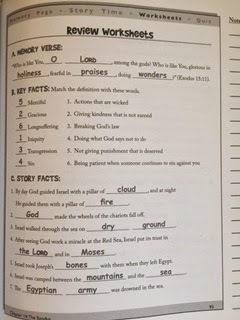 This page outlines the scope of the lesson, listing all Biblical chapters that correspond to the week. The theme for the week is listed as well as the memory verse. Key facts and terms to remember are also listed. 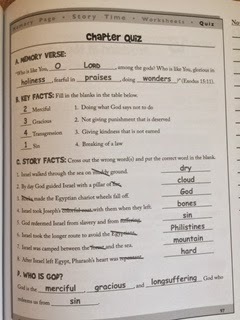 At the bottom of the page it asks the question, “Who is God?” and the specific aspect of God that is revealed through the story is listed at the bottom. This is a two-page (sometimes three-page) outline of the events of the chapter. These pages summarize the Biblical text in a straightforward but engaging way. There are two worksheets per chapter to reinforce the concepts taught in the lesson. The activities include matching, fill-in-the-blank, true/false, and crossword puzzles. At the end of each lesson is a short one-page quiz that covers the key aspects of the lesson. This program contains five units. At the end of each unit there is a lesson that contains a review of the unit. There are a total of 32 lessons in the program. 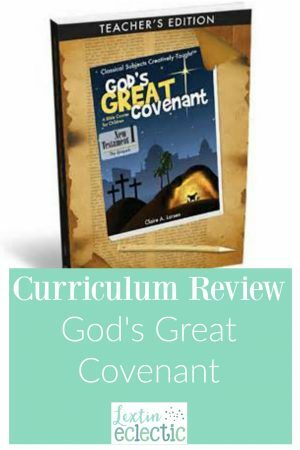 There are also extra resources in the back such as maps, list of memory verses, list of key themes, information about the tabernacle, the Ten Commandments, and suggested lesson plans. The program contains a teacher guide of the stories with additional notes and answers to all the worksheets and quizzes. There is also a student book with the text to all the stories and the blank worksheets and quizzes. I don’t quite follow the lesson plans. We’ve found a routine that is working well for our homeschool. Day 1: We read the Memory Page for our new lesson. We talk about the themes and facts and discuss who God is in the chapter we are about to read. Day 2: I review the Memory Page with Curly. We read the first page of the story out loud. Usually I read it to Curly and then I take short breaks to share information that is included in the Teacher Guide. Day 3: We finish reading the story after we read back through the Memory Page. Day 4: Curly does the worksheets with me while I check her answers and discuss them with her. Day 5: Curly does the quiz on her own and then I quickly review the quiz with her. I make sure to remind her of the facts we learned on the Memory Page as we end our week. This program only takes us about 15-20 minutes per day so it is a short amount of time to fit into our busy school day. I love that the program works straight through the Bible, covering all the main events. The program includes great explanations in the teacher guide to help further understand the stories. These tidbits are listed in the sidebars. Each lesson includes a short outline of how Jesus is foreshadowed in the Old Testament. This ties the entire Scripture together as you can see God’s plan from the beginning of time. Every week has a theme about God and draws your attention to an aspect of God’s character that can be vividly seen through the story. 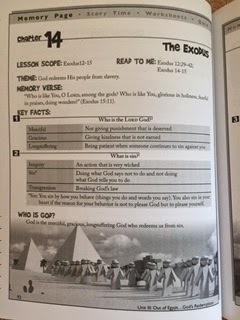 Each week has a memory verse that is from the chapters covered in the lesson (or from another part of Scripture but illustrates the theme). God’s Great Covenant is helping us see Scripture in light of God’s nature and His over-arching plan to send a Savior. I love how the program helps us connect Scripture with the theme of God’s faithfulness and His love.